Thanks to Nancy Benton who supplied the article. I did the transcription. GALESBURG, Mich – The presentation to the Galesburg Memorial Library recently of old Galesburg newspapers, some over 70 years old, revealed deatils of the short-lived socialistic society formed here over 100 years ago–the Alphadelphian Society. Among the gifts, from an anonymous donor, was a copy of the Primitive Expounder dated June 12, 1845, published by the Alphadelphia Association at Alphadelphia, Mich., which was located near here. 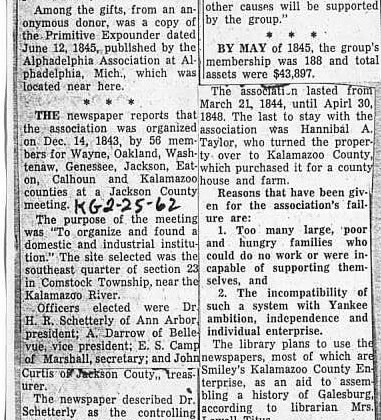 The newspaper reports that the association was organized on Dec. 14, 1843, by 56 members for Wayne, Oakland, Washtenaw, Genessee, Jackson, Eaton, Calhoun and Kalamazoo counties at a Jackson County meeting. The purpose of the meeting was “To organize and found a domestic and industrial institution.” The site selected was the southeast quarter of section 23 in Comstock Township, near the Kalamazoo River. Officers elected were Dr. H. R. Schetterly of Ann Arbor, president; A. Darrow of Bellevue, vice president; E. S. Camp of Marshall, secretary; and John Curtis of Jackson County, treasurer. The newspaper described Dr. Schetterly as the controlling spirit of the association. It said he was small, slender, and had dark hair and dark eyes. Comstock members resided in their own homes and other members in whatever they could find until a two-story mansion was constructed in the fall of 1844. The constitution told members “The religious and politican opinions of the members are to be unmolested and inviolate and no member shall be compelled to support any religious worship. By may of 1845, the group’s membership was 188 and total assets were $43, 897. The association lasted from March 21, 1844 until April 30, 1848. The last to stay with the association was Hannibal A. Taylor, who turned the property over to Kalamazoo County, which purchased it for a county house and farm. 2. The incompatibility of such a system with Yankee ambition, independence and individual enterprise. The library plans to use the newspapers, most of which are Smiley’s Kalamazoo County Enterprise, as an aid to assemble a history of Galesburg, according to librarian Mrs. Lowell Titus.